We help Commercial Label Printers with Short Run Digital Label Printing Machines along with cutters, slitters, winders, rolls of blank labels, rolls of blank media, inks and free help so they can print short runs of labels on a commercial scale with good profits. 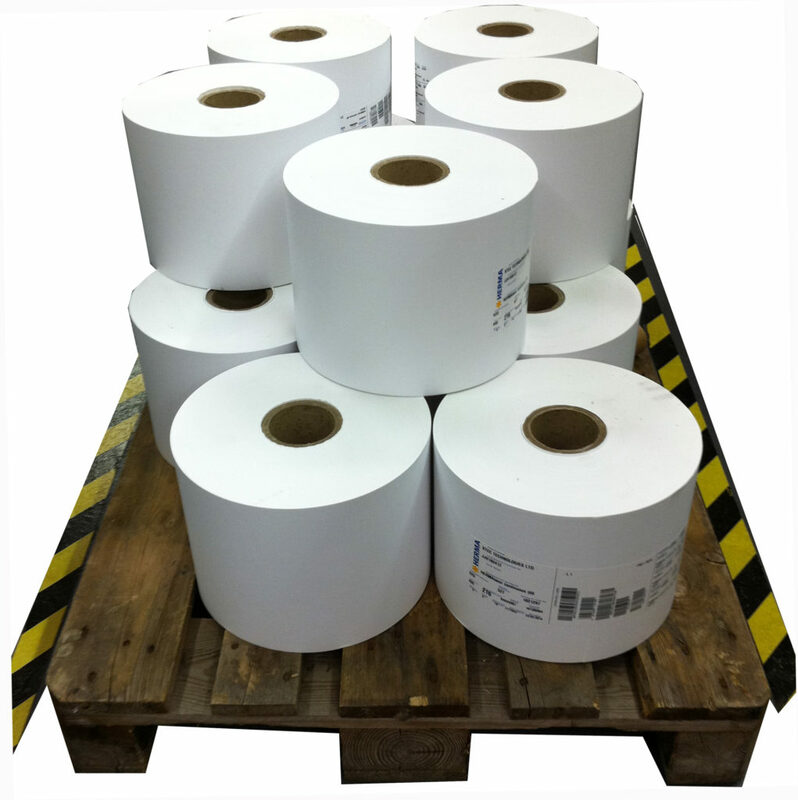 Two main ways to work …..
It’s possible to get started in a simple way by printing full colour labels in short runs on pre-cut self adhesive labels we supply to the trade on rolls in many sizes ready for use in one of our bulk tank roll labels printers. These digital roll printers take minutes to set going and the per label cost low and wastage next to nothing to maximise profit. Another method is to use uncut self adhesive label rolls, print the images onto the roll along with a small black registration mark, then use one of our digital finishing machines to automatically cut and wind the labels ready for sale. Our digital cutters often provide the option to laminate over the label images before cutting to create a high durable finish, then also to slitting the labels before final roll winding. VP700e Memjet has bulk ink tanks for printing low cost colour labels at speeds of 150mm and 300mm per second. The VP700e is self contained with an internal roll un-winder that takes 8 inch (203mm) diameter rolls of pre-cut blank labels or slit rolls of un-cut media. 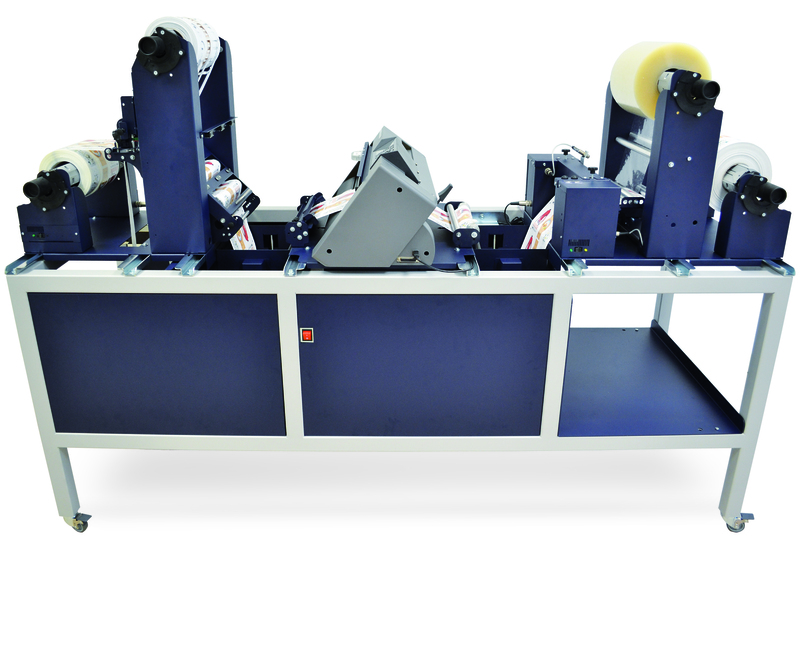 An optional high speed roll winder with dual supports for heavy rolls winds the labels printed on the VP700e to neat rolls for safe packing and transport to customers. 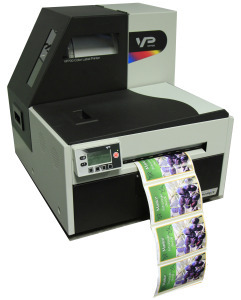 The VP700e’s print cost can be tracked in a screen on your computer and because of the large ink tanks used small labels can be printed for a fraction of a penny and large labels for a few pence. The cost of the printed label is the ink used + the blank labels cost. iCube Memjet also has bulk ink tanks for printing low cost colour labels at speeds of 150mm and 300mm per second. 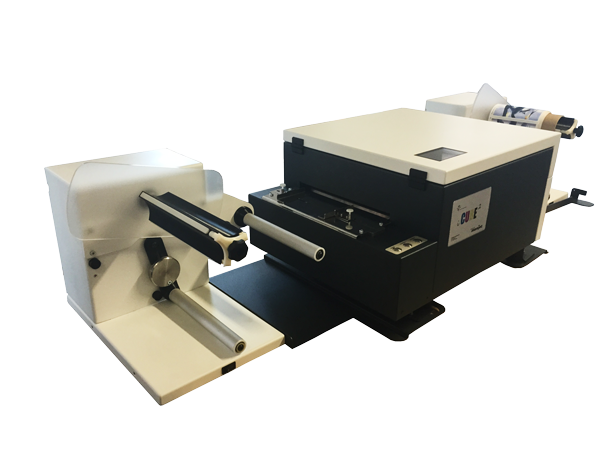 The iCube uses a separate un-winder and re-winder that takes large 12inch (300mm) diameter rolls of pre-cut blank labels or slit rolls of uncut media. The iCube winders are speed matched to the iCube printer for extra smooth operation with rollers to guide the material to the correct height in and out of the print engine. The iCube print cost can be tracked in a screen and with the large ink tanks used small labels can be printed for a fraction of a penny and large labels for a few pence. The cost of the printed label is the ink used + the blank labels cost. iCube and optionally laminate the labels before using an inbuilt camera to track and re-registering on the black marks and then automatically cutting out the labels regardless of shape. The labels pass through a drag clutch before being trimmed and slit into lanes and wound to neat rolls. 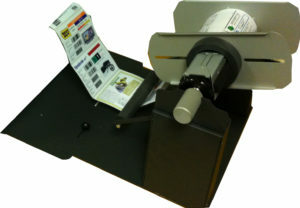 FX1200e is a desk size multi-blade blade digital label converter able to take printed labels from the fast CX1200e laser or iCube ink jet roll printers and optionally laminate the labels before using an inbuilt sensor to track and re-register on the black marks and automatically cutting out the labels regardless of shape. The FX1200e can be populated with up to 4 digitally steered cutting blades and the blades can also step sideways so the FX1200e is able to cut 1, 2, 3, 4, 6, or 8 lanes of labels! and stagger wind finished cut to size and shape labels on two separate winding shafts. All of the FX1200e winding shafts are all controlled by variable torque motors and supervised by a built in computer to ensure even tension and avoiding web breakages throughout the laminating, cutting, slitting and rewinding processes. CX1200e / FX1200e is a two desk size complete variable short run label print system. The CX1200e is a 2400dpi laser print engine and prints your label images onto low cost self adhesive label media rolls adding small black registration marks along side the print. The FX1200e then automatically re-registers and cuts out the labels. The system includes a label layout software called PTPrint that accepts label artwork as EPS files from say AI / CS or COREL DRAW for example and at the same time as printing automatically extracts the cut lines to be passed to the FX1200e for automated cutting. The CX/FX combo can use a wide range of label media including papers, pp’s and polyesters and with the laser toner being long life agaist sunlight and the laminate option the CX/FX is so good for high speed badge or sign making as well as digital label printing and finishing any side or shapes of labels in two desk size units. FX1000e is a useful desk size waste stripper / slitter / rewinder. It can finish digital printed labels from most print finishing machines by removing the waste, slitting and rewinding to two staggered quick locking shafts. 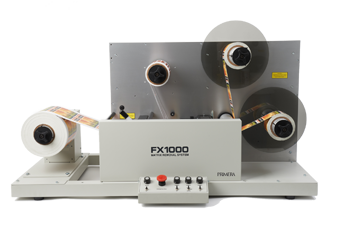 The FX1000e can also be used to slit down rolls of media or slitand rewind labels to smaller rolls suitable for use on small labels printers. NEW SOLUTION NS PRO and NS F22 is the latest in short run digital label printing. The NS 22 is a new series Memjet Sirius powered roll to roll label image label printer printing low cost variable data labels for converting on the NS F22. The NS F22 combines selectable liner or linerless laminating, digital blade any shape cutting, servo rotary high speed die-cutting, slitting and roll rewinding.